This trivia gameshow's bonus upgrade includes three years of Grammy Awards trivia from ceremonies 2016, 2017, 2018; the 58th, 59th and 60th Annual Grammy Awards! Beyonce, Bruno Mars, David Bowie, Kendrick Lamar, Adele, Chris Stapleton, Elton John, Chance the Rapper, Lil Wayne and so many more big Hollywood stars. Enjoy by downloading now! BarWhat? 10000+ Trivia Questions is amazing! BarWhat? features over 10,000 trivia questions. BarWhat? was named to “Best iPad Games Released Ever” critics list by Pocket Gamer! Now available on iPhone, iPad, universal devices! Fun trivia while you play, relax or socialize. BarWhat? 10,000+ Trivia features more than 10,000 unique trivia questions about Grammy Awards, Oscars, BAFTA, Tony Awards, NFL, NCAA, UEFA sports trivia, Hollywood celebrity and famous people trivia, USA Presidents & Vice Presidents trivia, geography trivia, science trivia and more fun! BarWhat? trivia guessing gameshow climbed gaming charts to #1 in Ireland and UAE, #3 in Japan, #4 in Australia, Sweden and Denmark, #5 in Canada, #7 in the USA and Denmark, #9 in Switzerland and #11 in the UK! BarWhat? is featured on CBS Interactive, CNET, ZDNET, App Annie, Gamespot, Applyzer, Broadway World, ToonFirst,Top Apps 24, Formidapps, and so many other leading app review and tracking websites. Now BarWhat? 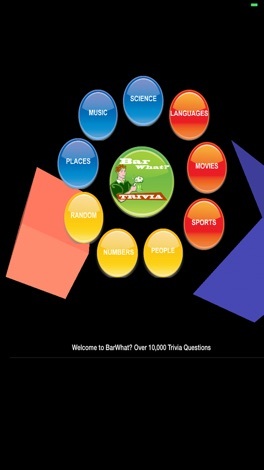 10000+ Trivia Questions is available for universal devices downloads. Fantastic! Like Hollywood movie and music trivia? BarWhat? 10,000+ features - Grammy Awards trivia, Hollywood movies and Oscars' Academy Awards trivia, BAFTA - British Film and Television Awards trivia, Tony Awards musical trivia and much more! Like sports trivia? BarWhat? 10,000+ features - NFL & NCAA trivia, UEFA European soccer sports trivia, NCAA, NBA, NFL, AFL, basketball, football trivia, Kentucky Derby racing horse trivia and more! Like science, math, and zodiac trivia? BarWhat? 10,000+ features - science trivia, zodiac signs trivia, the elements of compounds trivia, math trivia, and more! Like international and national geography and wild animals trivia? BarWhat? 10,000+ features - international, Canada, and USA national geography and animals trivia. Like obscure Presidents of the United States trivia? BarWhat? 10,000+ features - Presidents & Vice Presidents of the United States trivia. Like interesting famous people trivia? BarWhat? 10,000+ features - famous authors trivia, famous people quotes trivia, and so much more fun! BarWhat? 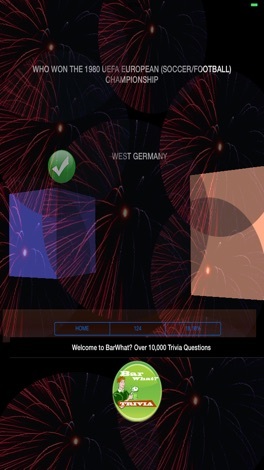 10000+Trivia Questions now available on universal devices - iPhone, iPad! Take on a long trip, play at a bar or pub, enjoy, and learn a new thing or two or 10,000! BarWhat? features over 10,000 unique trivia questions! Play with friends and family! Challenging yet really fun guessing game highly praised by leading gamer critics! Solve puzzles & pop corn in over 400 levels. The last pieces of popcorn are still in the pan (we all know those annoying kernels that never pop completely). Get your revenge on those pesky pieces of popcorn - It's up to you to finish the job and pop them all. 4 level packs each with over 100 levels.